It’s hard to believe it has been a ten years since “Supernatural.” Back then, Santana was just another fading Woodstock star. He has been living in the shadow of “Smooth” and “Maria Maria” ever since. With a title like “Guitar Heaven: The Greatest Guitar Classics of All Time” one could be excused for thinking Santana’s latest album was a repackaging of “Oye Como Va,” “Soul Sacrifice” and the rest of the jams that made him a guitar icon. Instead we are gifted with an album much more panderous. “Guitar Heaven” reunites Santana with label president/marketing guru Clive Davis for the first time since “Supernatural” and is the third consecutive album to follow its formula. The blueprint is simple: pair Santana’s guitar with some of the biggest pop voices of the moment in every genre. The twist this time is that every tune is a well-known cover, a great guitar classic, no less. Predictably, Davis invited Rob Thomas back into the fold, but this time the man who brought Santana his biggest hit is anything but smooth. The Matchbox 20 singer seems completely overwhelmed by “Sunshine of Your Love.” Joe Cocker fares better on the Jimi Hendrix staple “Little Wing,” but the performance still begs the question why anyone thought this project was necessary. 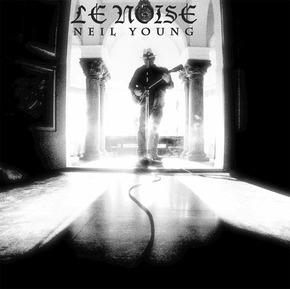 Neil Young’s “Le Noise” is a true celebration of the guitar. For his 32nd album, Young worked with famed producer Daniel Lanois. Lanois’ productions are frequently criticized for their big echoy sound and stark separation of instruments. They can often sound like Lanois conformed the artists to his vision, rather than the other way around. Although some of Lanois’ swampy trademark exists in “Le Noise,” his distinct fingerprints are absent for the most part. The reason is simple: there’s less for him to work with. All of the album’s eight tracks were cut live and feature only Young and his guitar. The result is a pastoral yet invigorating portrait of Young seated on his amp, volume cranked to 11, intimately and intently debuting his latest song cycle. While the guitar makes all the noise, Young’s songwriting makes all the difference. Without a bed of strong material, “Le Noise” would be a curio, like “Arc,” the album-length experiment of feedback and noise Young released in 1991. These songs could just as easily been delivered acoustically. Fortunately, Young and Lanois muck them up with waves of feedback and distortion. In the mid-‘90s, both Young and Santana were regularly releasing solid, if unremarkable albums that clearly came from the heart. Today their paths couldn’t be more different. In movie terms, Young is the actor who with a questionable resume, but has remained unquestionably independent. Santana, on the other hand, resembles the washed-up actor willing to do anything to land one last big role. But show-biz loves redemption stories. Let’s hope Santana has some Mickey Rourke in him.